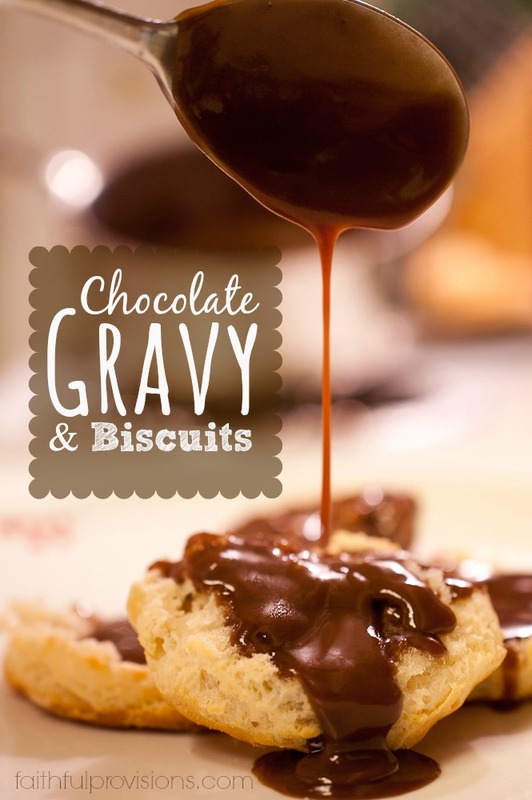 If you’ve never enjoyed Chocolate Gravy and Biscuits, then it’s about time you did! This is one of my favorite Recipes for Christmas Brunch, but it is very hard to limit it to only once a year. We Southerners are known for our love affair with biscuits. They are our very best comfort food, smothered in sausage gravy, jam, honey, or white syrup. For many, they are a staple at every meal. My husband Bradford grew up on a farm in Kentucky, and I spent plenty of time on my grandmother’s farm in Tennessee, and biscuits were a part of daily life. As we are raising our own family, we don’t get a daily dose of those flaky, floured layers since we are really trying to learn how to be healthy. However, on the special occasions when we do indulge, we go for it by drenching ours in my grandmother’s specialty: Chocolate Gravy. I hope you love this recipe as much as my family and I do! I know your kids will be crazy about it. To enjoy these like a true Southerner, you really must put a generous pat of butter on the biscuit. Then pour on the piping hot gravy. (The gravy will melt the butter, and it will taste amazing!) Don’t worry if you are not a baker and you don’t want to try making your own biscuits. The Pillsbury freezer biscuits go on sale often. (Check my Coupon Database for coupons.) These aren’t quite as good as homemade, but they sure do come pretty close. Whisk together dry ingredients in a small saucepan. Once combined, add milk and water. Bring to a boil over medium heat, whisking constantly until thick and bubbly, approximately 3-4 minutes. Take off the heat and stir in butter and vanilla. Combine cream and flour in a large bowl. Roll out and cut biscuits with a round cutter. Bake at 375 degrees for 20 minutes until golden brown. Serve biscuits open-faced, topped with butter, and drizzled with chocolate gravy. Over biscuits is my favorite way, but you can also pour it over pancakes! I am SO glad to see this recipe! When I was a little, the grandfather of a childhood friend would make this for us when he was in town. I had NEVER heard of such until they introduced it to me and I love it. I have not thought about it in years!! Now I’m going to have to make me some…thanks for sharing!! Sissy – This recipe will NOT disappoint! I was excited to see this recipe posted. Not too many have heard of chocolate gravy. My grandfather use to make it when I was little and know my mom makes it every time I visit. It is so yummy. We eat it a little different. We put our chocolate gravy in a small bowl with a pad of butter then dip or crumble our biscuit in it. And dipping bacon in it is a wonderful treat, too. You get that sweet and salt thing going on. YUM! YUMMY! I tried this last night and we all loved it. The kids have requested that I make this every weekend. I could not imagine this being good but I tried it anyway since I had every ingredient on hand. It was like a warm chocolate cake – but better. AWESOME! As a Southerner, I wasn’t so sure about the biscuit recipe, but I can report that both were DELICIOUS! The gravy had the same taste as my great-grandmother’s chocolate pie recipe and I would never had dreamed that biscuits without butter or shortening in the recipe would tasted so yummy! THANKS, Kelly! Angela – Thank you so much for the feedback. I am so glad you liked it. It was my Grandmother Kelly’s biscuit recipe, and they were ALWAYS great. She was an absolutely amazing southern cook. Can you used regular Hershey’s Cocoa powder for the chocolate gravy? That’s what I always use and it is YUMMY! Raquel, I think that should be fine. Try it and let me know! I grew up on this same yummy stuff here in Oklahoma. Grandma and Mom always used Hershey’s cocoa…delish. Crumbled bacon is a must…in my book!